Humans need at least one kidney in order to live, but we are all born with two. It is a pair of vital organs that serves the body by keeping the blood clean as well maintaining the chemical balance of the body. The size of the kidney is almost the same as the size of your regular computer mouse or almost the same size of our fist. It’s about 13 centimeters or 5 inches long, and the width is about 8 centimeters or 3 inches. It is located in the space below the rib cage, near the middle of our back. The kidney keeps our blood clean by filtering the waste out of our blood. Since the blood delivers the nutrients to the different parts of our body, some chemical reactions happen in the cells, which break down the nutrients and produces waste as part of the chemical reactions. These wastes need to be cleared out of the body; and this where the kidney plays an important role. Here, our blood which is carried by the renal artery to the kidneys is filtered out by the nephrons to remove the waste. Approximately one million nephrons or tiny filters are found inside the kidney and they produce almost 2 quarts of water and waste daily. The water and waste that the nephrons produce out of filtering the blood are what we call as urine. The urine is deposited to the urinary bladder, a storage sac for the urine. When the urinary bladder is halfway full, we then take it out of our body and deposit it in the comfort room. The tube where the urine slides out of the kidney is known as the ureter. The urethra, on the other hand, is the tube that takes the urine out of the body. Combine all of these organs together and you have your complete urinary system. Homeostasis is another function of the kidney. It aims to achieve chemical balance in the body by balancing the amount of minerals and fluids in our body. 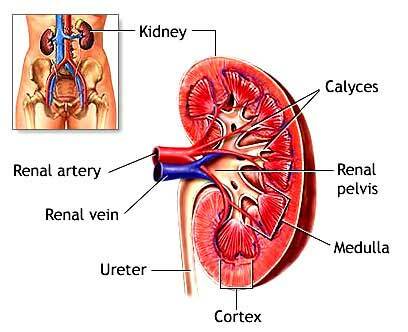 It is the job of the kidney to regulate the water level of the blood, regulate the blood pH level, excrete urea as well as other wastes in the body, re-absorb some important substances from our blood, and maintain the levels of salt and ion in our blood. If the body is not able to perform homeostasis, it could lead to death or to a disease. The presence of toxins in the blood stream is fatal and could damage other organs in the body. Aside from the cleaning and the filtering of the blood as well as homeostasis, our kidney also produces some hormones that our body needs. It produces the hormone which stimulates our bone marrow so that it can produce red blood cells. This hormone is known as EPO or erythropoietin. It also produces rennin, which is a hormone that regulates our blood pressure. Lastly, it also produces calcitrol, which is Vitamin D in its active form. It helps in the maintenance of calcium for our bones and it is also used for normal chemical balance in our body.